Dynon's EFIS-D100 is the most affordable large screen Electronic Flight Information System on the market today. Based on the best-selling EFIS-D10A, the 7" wide-screen display features large, easy to read text and graphics and is capable of displaying multiple pages side by side in a split-screen format. 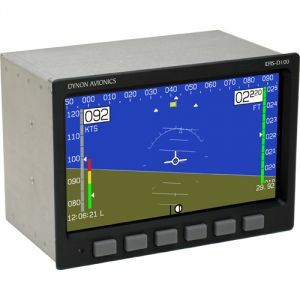 The instrument integrates multiple flight instruments, including airspeed, altitude, gyro-stabilized magnetic compass, turn rate, slip/skid ball, bank angle, and vertical speed. Other useful functions include a clock/timer, g-meter, voltmeter and density altitude/true airspeed calculator.